It is the time of year again when the seas are often blanketed by a layer of fog. Though it can make spotting more challenging, we are still very successful at finding whales! We searched west of Victoria this morning, with all the whale watching boats dividing up to cover the most water possible. We stopped in at Race Rocks Lighthouse as we searched the area. Race Rocks is never a place to miss with it’s growly and lazy sea lions. Two species live here- the chocolate coloured California sea lions and the two-tone honey-brown coloured Steller sea lions. They scratched their chins, bullied each other for space and seemed to enjoy another Saturday morning resting on the islets. We continued our search for whales and we were glad to escape the fog to the south. A humpback must have felt the same way, because we soon spotted the tall, bushy exhale of one of the greatest mammals on Earth! 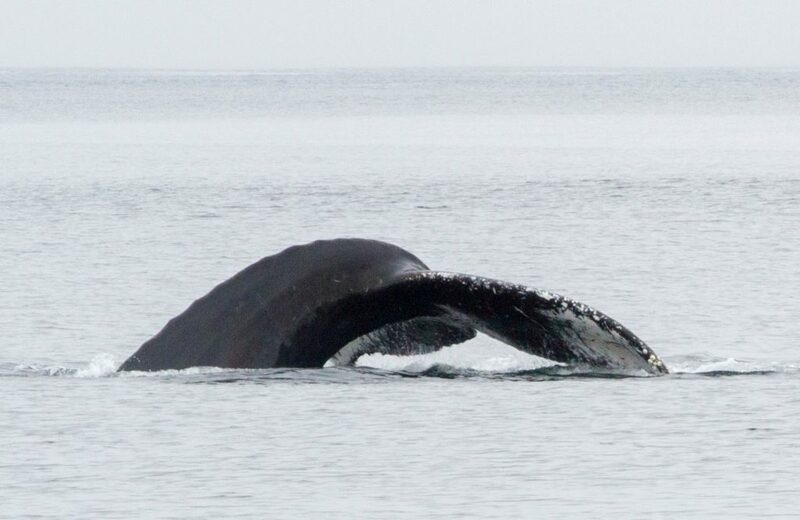 We call this humpback Dimple because it has a large dimple or divot on its back, near its dorsal hump. We were treated to several tail fluke events and holy macaroni, are humpback tails ever big! We had to search far and wide today, but nature rewarded us with fur and fins alike! No two trips are the same when it comes to whale watching, which keeps our days exciting and always adventurous! We received a radio call that there may be mammal-hunting killer whales heading south down Haro Strait! It was a bit of a journey, but we finally started to see the rise and fall of tall, black dorsal fins. There was one adult male with a big nick out of the top of his dorsal fin- it was T87! He travels with his adopted family, the T90’s. T87 is getting to be quite the senior, being born in 1962. The average life expectancy for male orcas is 40-60 years old. The matriarch of the group is T90 and she was born in 1980. Her son T90B was born in 2006 and her daughter T90C was born in 2010. Though not yet in the ID guides, it looks like T90 has added another little sprout to her harem as there was another tiny dorsal fin in the mix! The whales traveled close to the shoreline along Stewart Island, making their way past Henry Island and beyond. We got to see a few splashes, with the whales most likely being playful rather than hunting a seal. They are often on the prowl though as they need to catch 1-3 seals per day per family member! 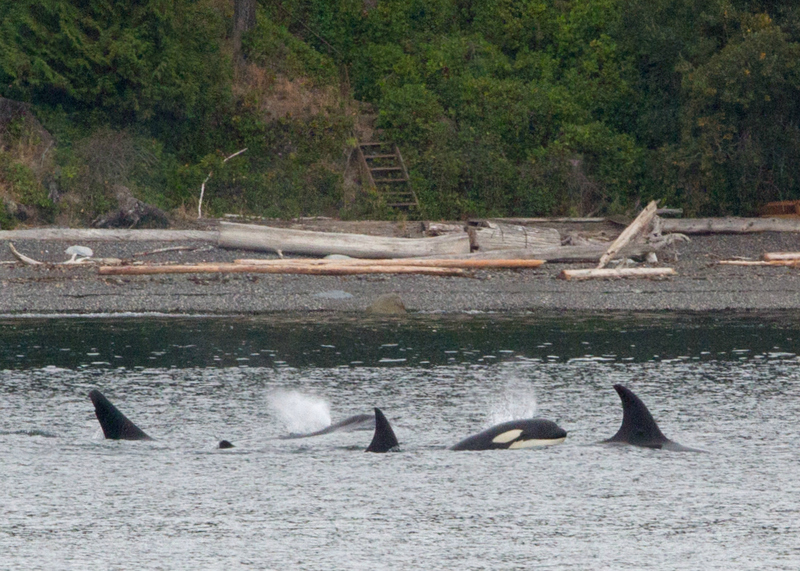 It was exciting to see these black and white top predators of the sea, enjoying a jaunt close to their family members.